The city of Crawford will celebrate the 150th anniversary of its founding with a full day of events Saturday. Crawford residents gather for the recent high school homecoming parade. Another parade and a full of day activities will take place Saturday when the town celebrates its 150th anniversary. Crawford resident gather for the recent high school homecoming parade. Another parade and activities will take place Saturday when the town celebrates its 150th anniversary. Crawford residents gather for the recent high school homecoming parade. Another parade and activities will take place Saturday when the town celebrates its 150th anniversary. 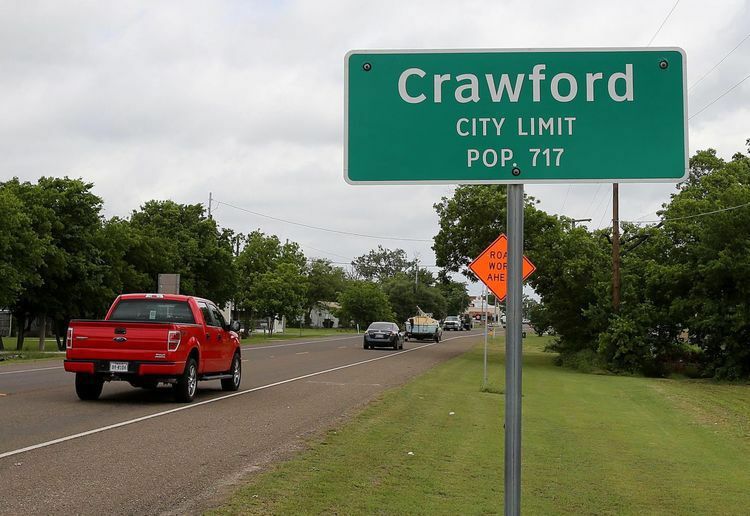 A city of Crawford anniversary celebration Saturday will incorporate elements of the town’s 150 years of existence into more than the event’s name. A parade will highlight the progression of transportation, with an 1860s covered wagon pulled by livestock and a 1923 Ford Model T expected to roll through. “Since this is a historical event we’re trying to get historical stuff in as much as we can,” said Van Massirer, a lifetime Crawford resident and a member of a committee that has spent the past year planning the celebration. The all-day Crawford Celebrates 150 Years event is free to the public. A parade at 9 a.m. on Main Street will kick off the celebration, and a dance will cap off the evening. An opening ceremony is scheduled for 10 a.m., after which, food and craft vendors will open, along with a kids zone, exhibits, and a sports and classic car show. At Chaney Brothers Coffee Company on North Lone Star Parkway, several lecturers will speak on topics including cotton in Crawford and the Chisholm Trail. Massirer said festivities will also include the “Best little Ag Show in Texas.” The show will highlight the evolution of farm equipment, showcasing tools used in plowing, planting, cultivating, harvesting and ranching work, he said. Equipment from the 1860s right up to modern farming tools will be lined up in chronological order to allow guests to walk through history, he said. There will also be a washer tournament, antique tractor show and model train display. Red Bull Gift & Gallery will have displays set up highlighting the city’s history. Small towns rely heavily on volunteers, and Saturday’s festivities are coming together thanks to volunteers, Mayor Marilyn Judy said. Judy is also a Crawford Chamber of Commerce official, and the chamber is sponsoring the event. The volunteers who formed a group to put the anniversary celebration together have worked hard, and Judy hopes the event draws a lot of people, she said. From 11 a.m. to 2 p.m,. the 100-year-old elementary schoolhouse on Prairie Chapel Road will open for tours, and the Crawford Museum will open its doors 1 to 4 p.m.
Daytime festivities will come to a close at 5 p.m., leaving time to get ready for the dance. Music and dancing will run from 7 to 10 p.m. at the Amsler Building. Entrance is free, and guests can bring their own beer. Massirer said his family has lived in Crawford since 1892. The McLennan County commissioners court recognized the city of Crawford’s anniversary celebration Tuesday with a proclamation. Members of the Tonkawa Tribe appear to have been the first human inhabitants of the Crawford area, and artifacts reveal the area along Tonk Creek, now known as Tonkawa Park, served as a campground and a burial ground, according to the proclamation. By 1867 in the aftermath of the Civil War, traces of modern Crawford started to appear with an influx of settlers from the Deep South, the proclamation states. 7 to 10 p.m.: Music by Brian Birkes at the Amsler Building. Event is free and BYOB.